با توجه به اهمیت و کاربرد گسترده فراورده‎های نفتی و نیز خطرات ناشی از این فراورده‎ها بر منابع آبهای سطحی در کشور، به‌کارگیری مدل‌های مناسب به‌منظور ارائه اقدامات و برنامه‎های مدیریتی مهم و ضروری است. در این پژوهش دو نسخه از مدل اصلاح شده CE-QUAL-W2 به‌منظور شبیه‎سازی رویداد سقوط تانکر حاوی سوخت ماده فرار آلی MTBE در مجاورت رودخانه خلیفه ترخان در اسفند1381 مورد استفاده قرار گرفت. 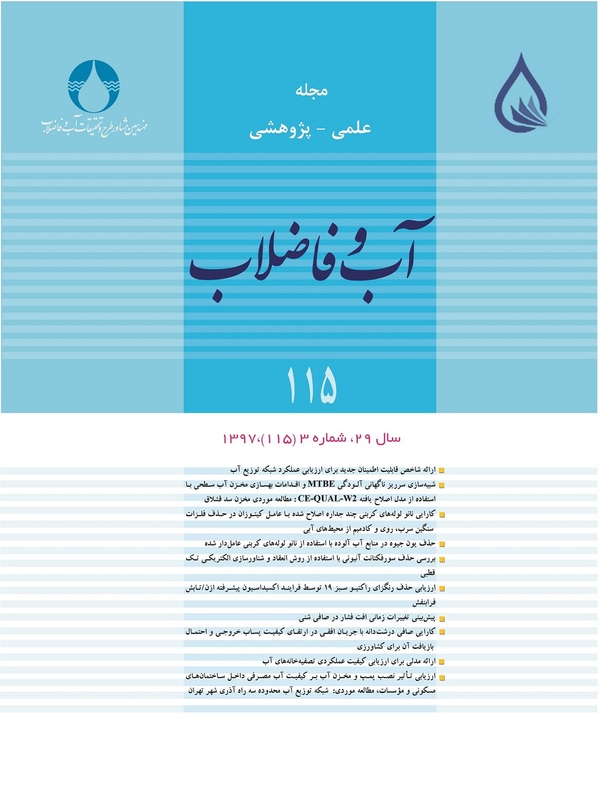 در این مدل، روش‌های بهسازی شامل استفاده از ابزارها و تجهیزات مکانیکی به‌منظور ایجاد آشفتگی، اختلاط و هوادهی مصنوعی به‌کار گرفته شد. بر اساس نتایج حاصل شده، نسخة دو مدل CE-QUAL-W2 در مقایسه با نسخة یک مدل، قادر به ترسیم مناسب‎تری از توزیع زمانی و مکانی شرایط کیفی آلودگی در رابطه با داده‎‎های میدانی ثبت شده برای MTBE است. علاوه بر این، محاسبه زمان پاک‌سازی مخزن سد قشلاق در سناریوهای متعدد هواشناسی و هیدرولوژیکی، مقدار بار MTBE و نحوه بهره‎برداری از مخزن سد نسبت به سناریوی پایه مورد ارزیابی قرار گرفت. نتایج حاصل از این قسمت پژوهش نشان داد که کاهش دمای هوا و افزایش سرعت باد، سبب کاهش زمان پاک‌سازی مخزن سد می‌شود. همچنین، عامل دیگری که سبب کاهش زمان پاک‌سازی مخزن سد قشلاق می‌شود عبارت است از افزایش جریان دبی ورودی و یا دبی خروجی. Due to the importance and widespread applications of oil products as well as their threats to surface water bodies in Iran, it is inevitable to apply suitable simulation models to develop management plans, actions, and appropriate scenarios . There are two modified versions of CE-QUAL-W2 and both can be used for simulations of emergency pills of toxic waste in transpotation roadways. In this research, both modified versions were employed to simulate the fate of Methyl tert-butyl ether (MTBE) (a gasoline oxygenated addetive) during an emergency spill. As a case study, the application of both models was used to evaluate the MTBE emergy spill that occurred on March 2003 near Khalifeh Torkhan river. Several remediation techniques including artificial turbulent, mixing, and aeration were used during the simulation study. Results showed that the modified version of the model (CE-QUAL-W2) depicted a better temporal and spatial distribution of MTBE pollution in reservoir compared compared to the first version of the model. Multiple scenarios were simulated in this study under various meteorological, hydrological, and MTBE loading for Gheshlagh reservoir. The simulation results showed that lower air temperature and higher wind speed are among the factors that reduces the reservoir recovery time. In addition,, another parameter that found to decrease the recovery time of Gheshlagh reservoir is an increase in reservoir inflow and/or outflow rate. Bartram, J. & Balance, R., 1996, Water quality monitoring, 5th Ed., Van Nostrand Reinhold, New York. Camp, J.V.S., 2009, "Design and implementation of an advanced spill management information system for surface water", PhD. Thesis, Vanderbilt University, USA. Chapra, S.D., 1997, Surface water quality modeling, 1st Ed., Mc Graw-Hill, New York. Cole, M.T. & Wells, S.A., 2006, "CE-Qual-W2: A two–dimensional, laterally averaged, hydrodynamic and water quality model, version 3.5, user manual", U.S Army Crops of Engineers, Washington, DC. Saadatpour, M., & Afshar, A., 2013, "Multiobjective simulation-optimization approach in pollution spill response management model in reservoirs", Water Resource Management, 27, 1851-1865.